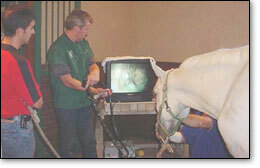 Gastric endoscopy by Dr. Hyde showing ulcers. Acceptance to the school is conditional upon the approval of Dr. Raymond Hyde. Students are expected to have horsemanship skills through their prior experience with horses. Placement is not reserved until a deposit of $750 is received.